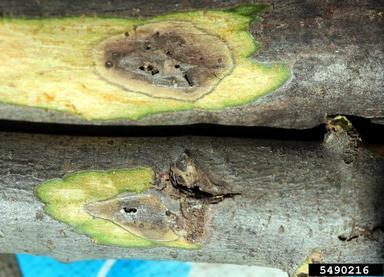 Oak wilt is caused by a fungus, Bretziella fagacearum (previously called Ceratocystis fagacearum). 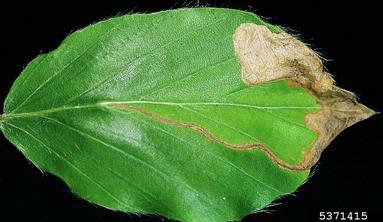 It is a vascular wilt disease, similar disease to Dutch elm disease, however, is much deadlier. 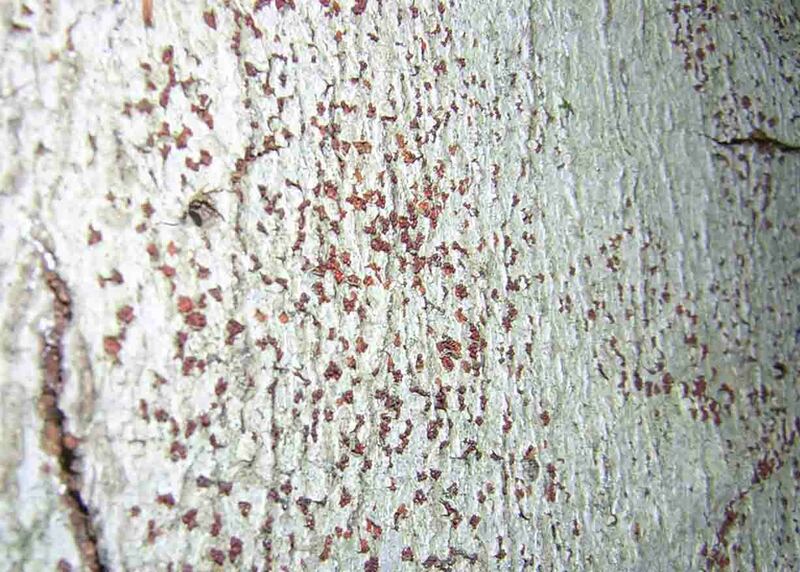 It is a serious threat to the red oak group, however in many cases can be prevented. 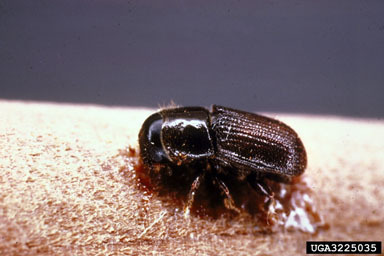 Oak wilt was first detected in Wisconsin in 1944 and is found within much of the central and eastern U.S., but the origins of the pathogen are not known. Oak wilt is not known to be in Canada at present, however, is quite close - 574m away in Belle Isle State Park, Michigan. 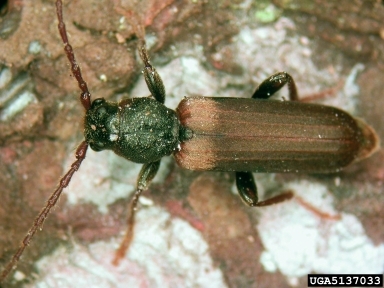 Oak wilt is introduced to the tree by via root grafting and by beetles. Once the fungus enters the sapwood, initially in the outer growth rings, it stimulates the formation of tyloses (balloon-like structures). Circulation to the crown of the tree is impaired and leaves start to wilt. After the tree dies fungal hyphae grow inward through the sapwood and outward through the cambium. In red oak species, sporulation mats then develop under the bark, forming pressure pads which cause the bark to crack and detach. In white oak species, fungal growth is hindered and can be sequestered by the tree. 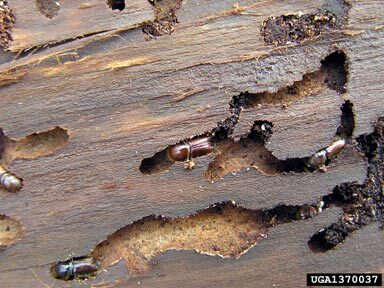 Oak wilt is transmitted over shorter distance by root grafting, and longer distance transmission is by bark beetles and nitidulid beetles. 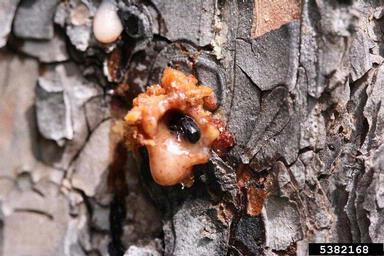 Nitidulid beetles (sap beetles, picnic beetles) are attracted to the fruity smell of the sporulating mats under the bark. 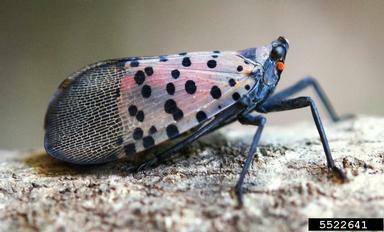 Fungal spores adhere to the beetles when they walk on, and feed from, fungal mats. 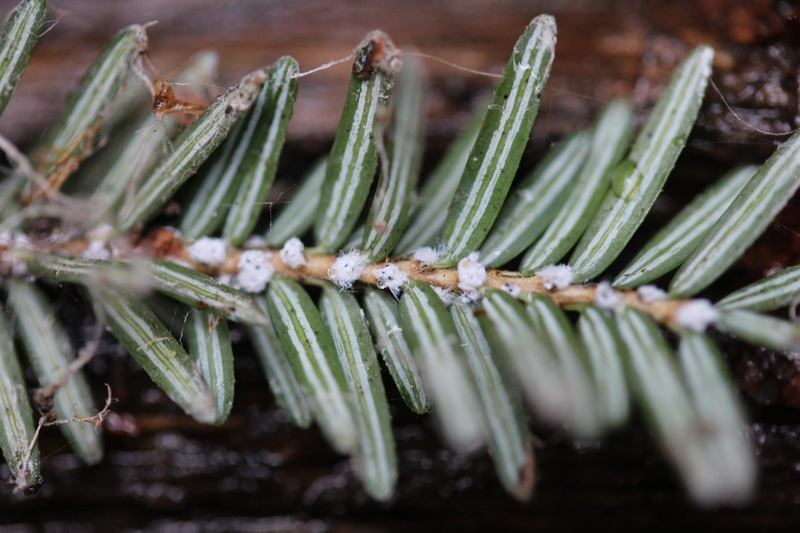 They then transmit spores to fresh wounds on healthy trees, as they are also attracted to the smell of fresh sap from tree wounds. All oak (Quercus) species are at risk. 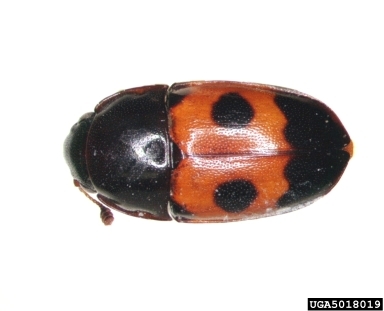 Species in the red oak group (e.g. red, black and pin oak) are at greatest risk and tend to die quickly, usually within a year, and sometimes within a few weeks of infection. 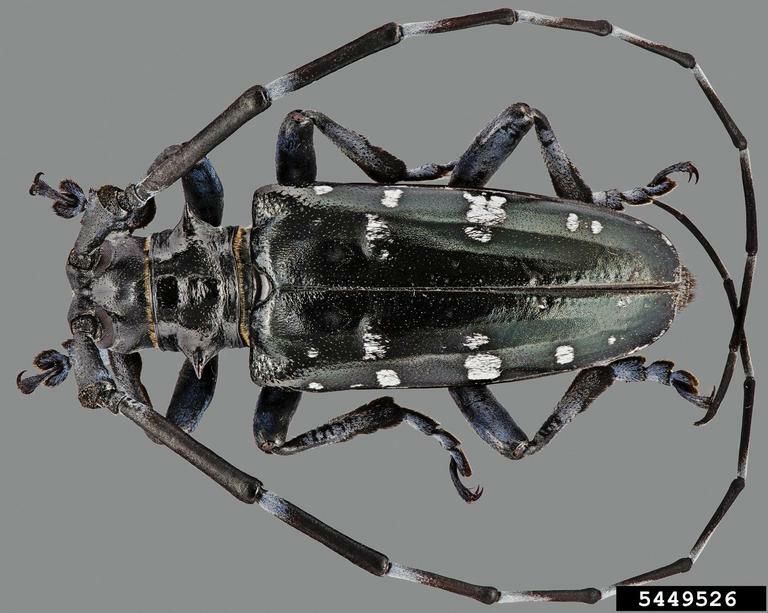 Species in the white oak group (e.g. white, swamp white, bur oak) tend to be more resistant and may show damage on only a few limbs for a time. White oaks can eventually succumb to oak wilt, but this may take a few years; some seem to be able to survive the infection by walling it off. 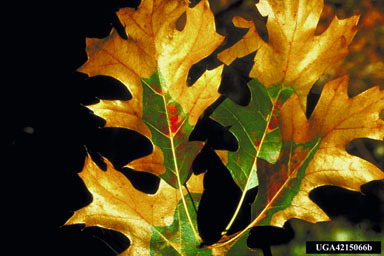 The difference in the resistance between the two oak groups is thought to relate to the vessel diameter, which is smaller in white oak species, and on the more intensive tyloses formation in white oaks which serves to hinder the spread of infection; white oaks are also able to encase the infection with subsequent annual rings. Bur oak is intermediate in its ability to resist infection - some are able to resist infection, while others die quickly. Some apple (Malus) varieties, chestnut (Castanea), and other species are also susceptible to infection. Oak wilt is currently distributed from Texas north east to Minnesota, Pennsylvania and New York State. It is less that 600 meters from Canada on Belle Isle, Michigan. See a map of current range of oak wilt in the U.S. In red oak leaves wilt and turn brown, starting from the top of the tree and the tips of the branches before spreading down through the crown. Individual leaves brown from the tips and margins inward (sidebar). Affected leaves start to drop from the branches within about three weeks of infection. Tree decline begins as early as May, through to mid-summer. Infected red oak will die quickly after the onset of symptoms, usually within the same season and in as little as one month. Unusually early leaf-fall on red oaks should be examined. 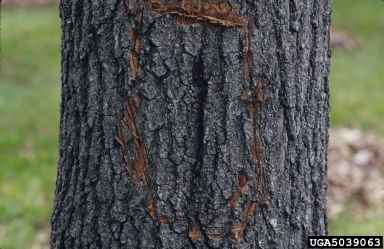 Sporulating mats (pressure pads) develop under the bark of red oak in the fall on trees infected in spring or early summer, or the following spring for trees that are infected later in the summer. Look for bark cracks on the trunk or large branches of newly dead trees. Drumming on the trunk over a pressure pad produces a hollow sound compared to drumming over intact sections of the trunk. 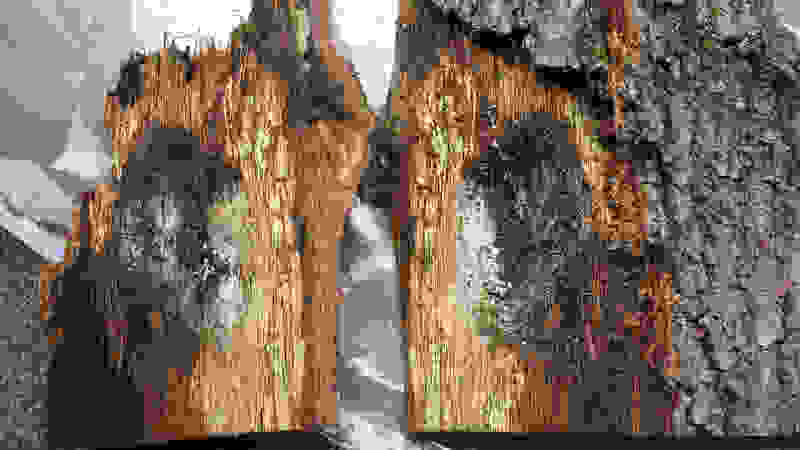 Pull off the bark around the crack or hollow-sounding region and look for an oval shaped area of fungal growth (see sidebar). Pressure pads have a characteristic fruity smell likened to fermenting apple cider, or Juicy Fruit chewing gum. Once the bark cracks open though, many insects and pathogens colonize the dead tissue, making it more difficult to identify pressure pads. Diagnosis of oak wilt is by the presence of pressure pads, or the culturing of lab testing of wood tissue samples. White oak species may or may not show symptoms of oak wilt. When they do, leaf browning is more subtle than on red oak species, and there is less defoliation. There may only be a few branches showing symptoms. Pressure pads are less common on white oak species, diagnosis is by wood tissue sample. 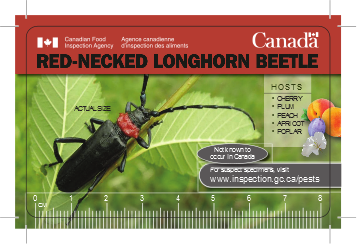 There is no cure for oak wilt, however, it is preventable. 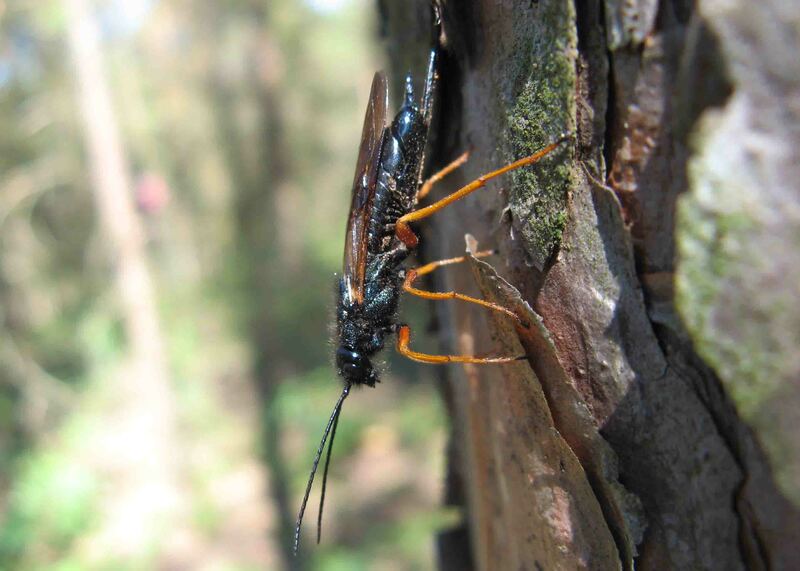 Minimize tree wounds during the flight season of insect vectors. Refrain from pruning, harvesting, or otherwise harming oaks from April to August. 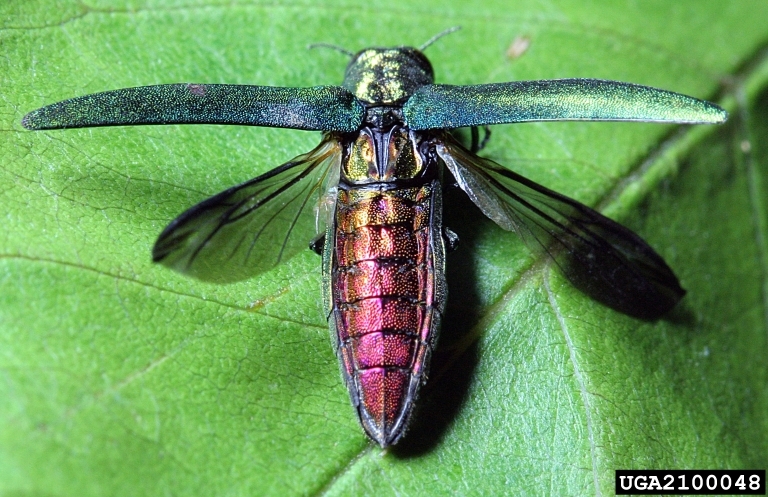 If you must prune during insect flight season, mitigate it by immediately covering the wounds with tree paint; this prevents nitidulids from detecting the wound. Image: Kathleen Ryan, Silv-Econ Ltd.